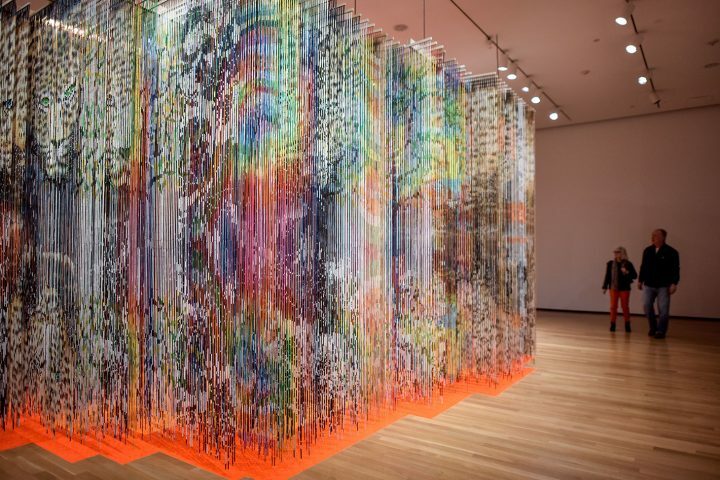 Hyperallergic spoke with Cave about what it means to surrender to the sacred, and how a queer perspective brings liberation and a way of seeing and being in an at-times seemingly disconnected world. 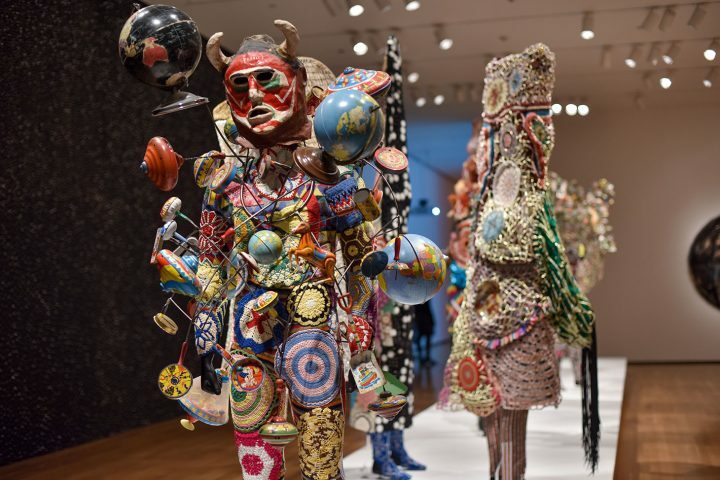 AKRON, Ohio — Nick Cave made his first Soundsuit in 1992 as a reaction to the beating of Rodney King by members of the LA Police Department, and has created over 500 since then. 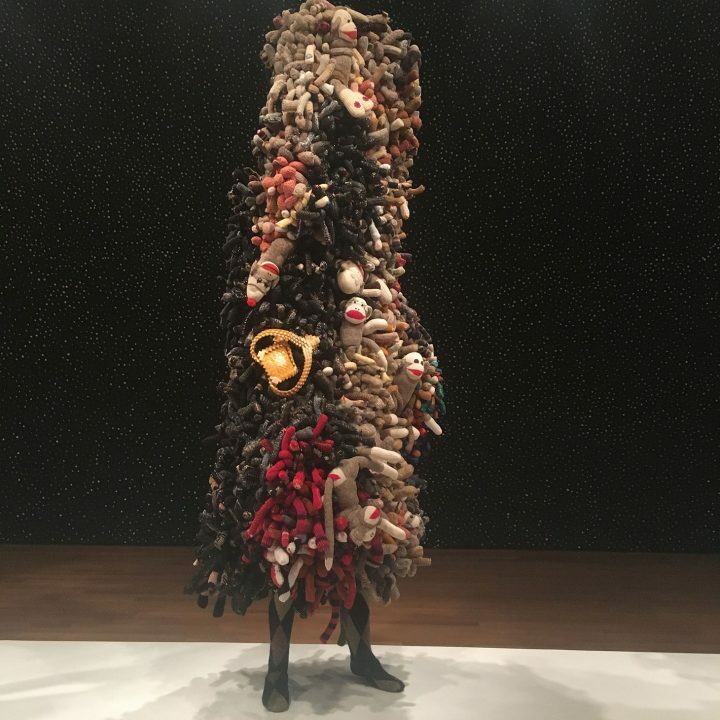 The individual objects embedded in the Soundsuits include buttons, twigs, and toys and feel everyday and familiar, but through Cave’s juxtaposition of these objects, something other and unfamiliar emerges. 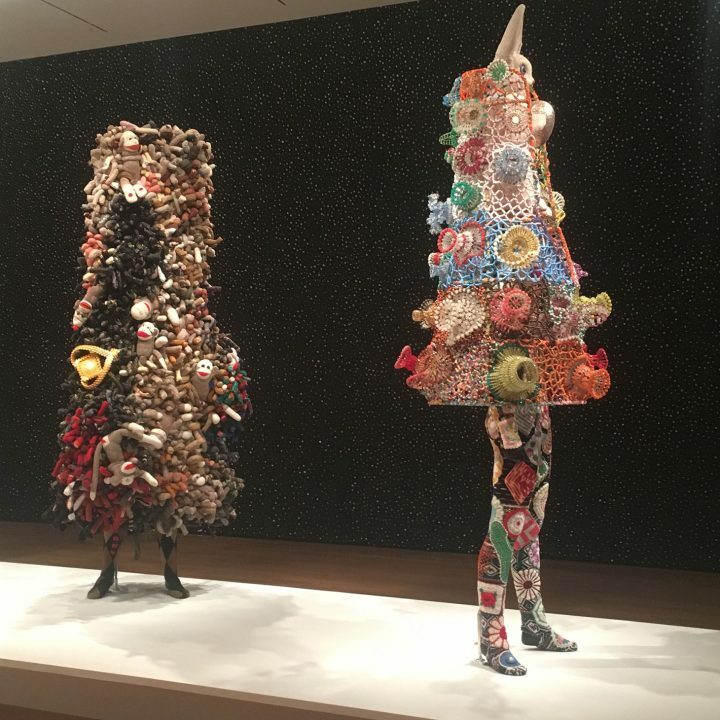 Hyperallergic met with Nick Cave at the Akron Art Museum as he installed his current exhibition, Feat. 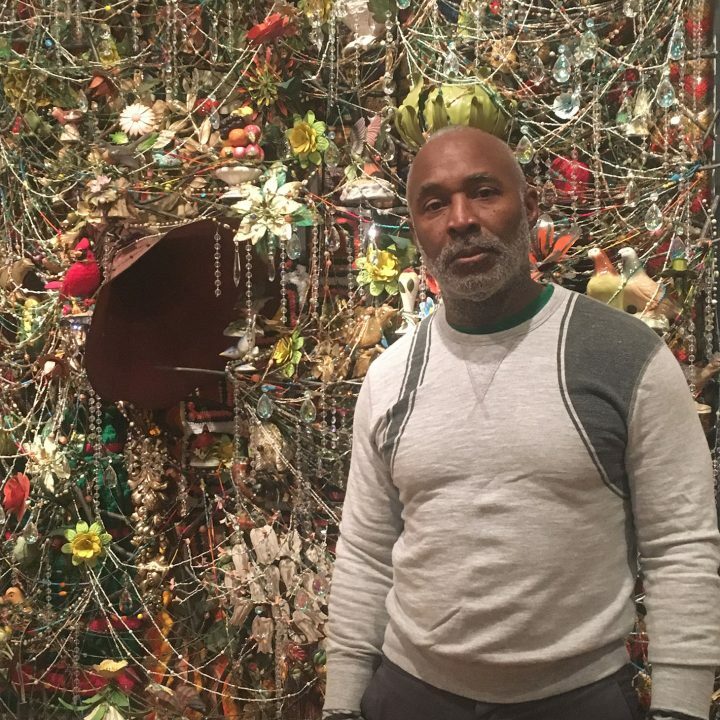 (February 23–June 2, 2019) and contemplated the creation of his forthcoming show at the Smithsonian. Against a black backdrop adorned with thousands of silver buttons that Cave described to be like “infinity, the constellations,” “the sort of space that allows us to open up to and surrender to the experience,” Hyperallergic spoke with Cave about what it means to surrender to the sacred, and how a queer perspective brings liberation and a way of seeing and being in an at-times seemingly disconnected world. 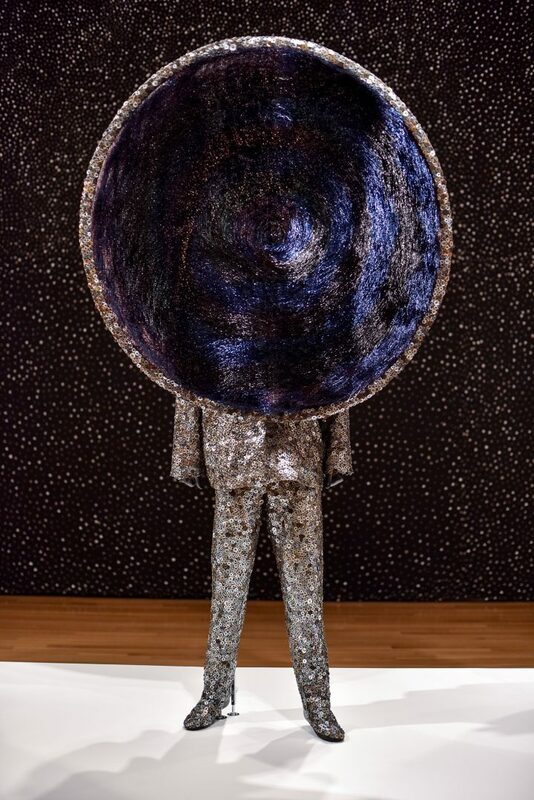 Hyperallergic: How does it feel for you to put on one of your suits? 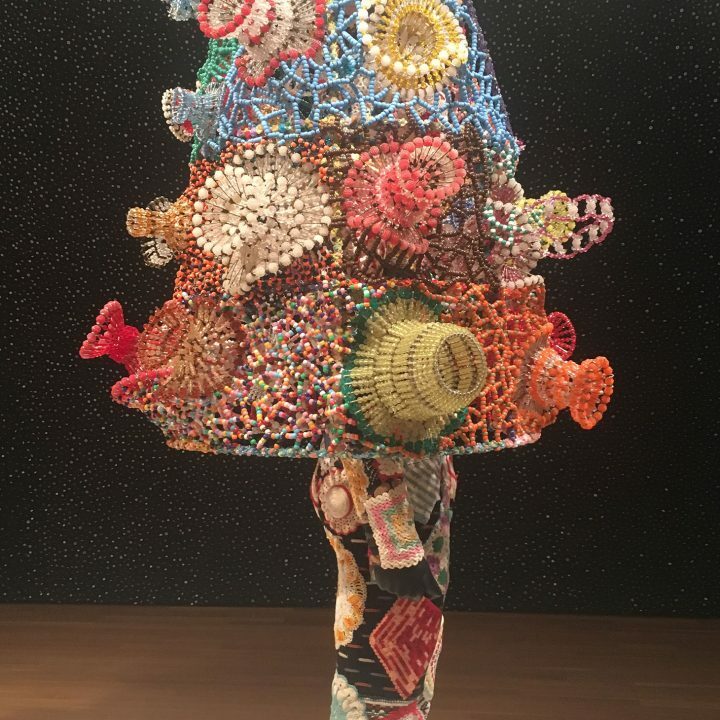 Nick Cave: Oh, it’s — it’s fabulous. It’s hard. NC: Because you have to understand that the moment you are shielded, your identity is no longer relevant. And so what does that mean? How do you step into the unknown? How do you deal with the limitations of weight, of movement? How do you accept what is about to happen? And what are you imagining is going to happen? What does that feel like? You put it on — you don’t even move. What is the weight of it? Because it’s really liberating if you know how to surrender. And you must surrender because it’s so dominating. It’s all of these conditions — it’s a process. It’s all about projection. How do you project? … It’s all internal. And if you do not know your core and … your internal being, it’s very, very hard. But when you think about it, just to be everyday — it takes everything — just to be … your authentic self, don’t you think? NC: [Smiles and laughs] It’s like if I was to wrap my arms around you and embrace you, you have to give into that. Until you do, it’s going to be a constant struggle. And so what happens is that when I am working with a group of performers, people just fall apart. They get emotional. There are breakdowns. But that’s all part of the process. It’s about a willingness to surrender and give yourself over to the experience … It’s hard. But the moment you do — oh my god. You have moved through something and somehow you come out and you’ve elevated. You’ve shifted your internal self into the expectations of your being, and it’s greater than you even imagined. H: Your work has a ceremonial and ritualistic element to it. Do you feel like your work is sacred? NC: Oh, totally. 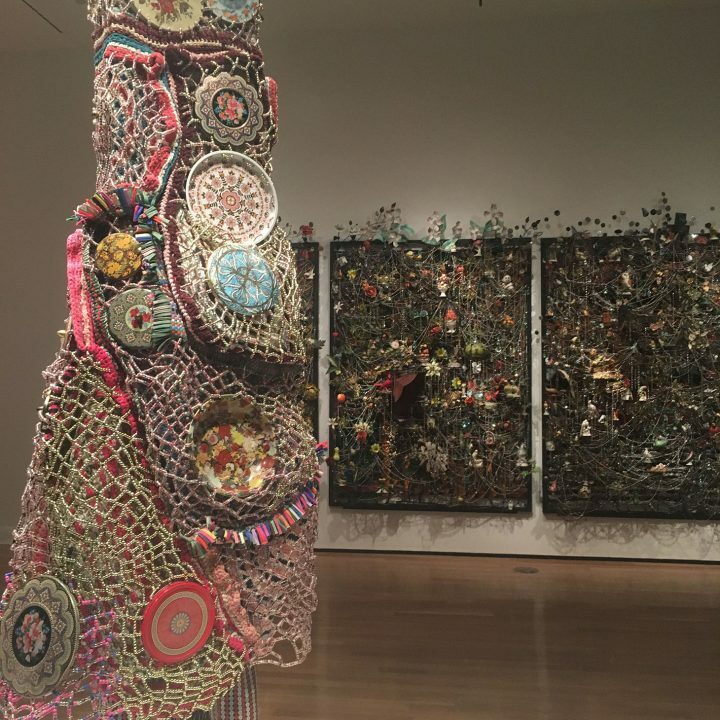 I think they’ve become altars, shrines — these alternative relics that contain or hold a spirit. But that’s something that I used to run from. I think I was running from [that idea] because I couldn’t define it. But the moment I accepted it, then it was all okay. I think it all came down to the moment I accepted that I was a messenger. Then everything else sort of faded away. Like the pressure of being an artist didn’t matter because it was, you know, this — I’m here to deliver this deed and then I move on to my next assignment. So it’s like the work in the studio, I can make it, I can build it, but, for some reason, I’m not attached to it. H: How do you feel your work deals with injustice of the day, and what we need? NC: Well, I think that’s just it. When I look at the survey of this group [of Soundsuits], it all still ties with injust[ice] at the end of the day. Will I ever be done with the Soundsuit is really the question … For me, how do I use this work? It’s a vehicle for change … it’s working within this community outreach perspective. I go into communities — I have no idea what I’m getting into. I know what the outcome must be, but I have no concept of who I’m going to be engaged with, the background of any of these individuals, but the willingness to dive in is 110%. What people see on the outside is never what is gratifying for me. For me, it’s really the process, and the behind the scenes. We did this one performance, a piece titled “Up Right,” in Atlanta. Towards the end of the performance we would walk up to the audience, and then we would just reach out and grab someone’s hand … and you would just … hold it as long as you … needed to. So it was not like a handshake … it was really this sort of transmitting. It was amazing. How do we receive, and how do we offer energy and things that we need? How can you do this sort of missionary work so that you can hand off and they can continue? NC: Yeah. That’s what all of this is about. This is art through this vast vernacular of service … For years, I’ve always been sitting in silence — two, three hours, just sitting in silence. It allows me to also think about the importance of that within my existence. Can you imagine if we all had to do that every day? NC: Seriously. We’re just so consumed by so much, and then we’re not doing our work. H: The Soundsuits cover and change identity, so can identity be performed? NC: We all [perform identity]. We all can. It’s all survival, right? Do what you have to do. H: What does the identity of “queerness” mean to you, and how do you bring a queer perspective to your work? NC: What does it mean to me? I think it means just being liberated, and being extremely comfortable in my skin. It’s no different than, you know, my blackness. I am what I am. It’s not a stigma, or a crutch. 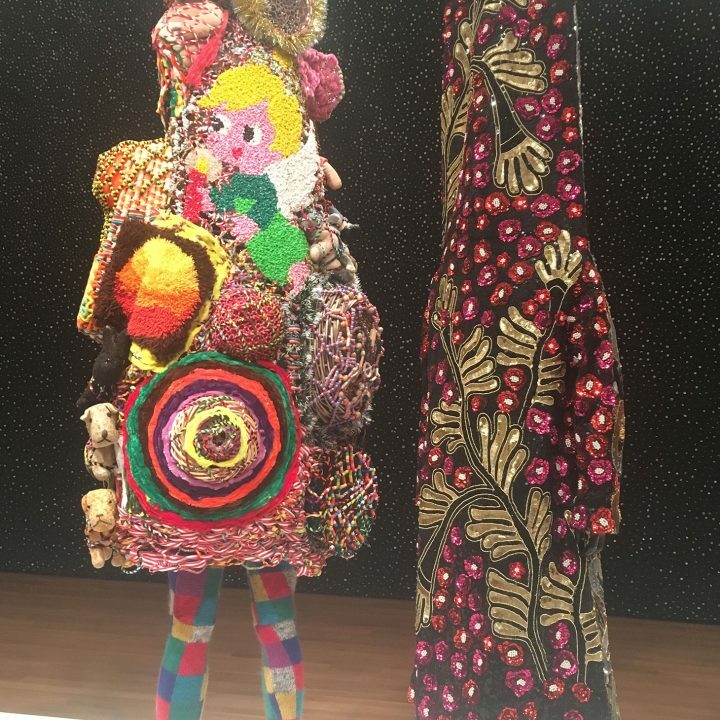 There is queerness that would dress this way [gesturing towards “Wall Relief,” four 97 x 74 x 21 inch canvases layered with extravagant strings of crystals, metal flower, ceramic birds, and afghans], but this is not how I dress. This [“Wall Relief”] is the output of my queerness, let’s say. It’s how I think, in terms of the world in which I operate, and yet, it’s not the world in which I live. In terms of my own private space — it’s very minimal, it’s very stark. But the studio environment allows me to dream in this very complex dance and space of working with nothingness and making — this extraordinariness comes through and out of that space, of looking and feeling liberated and independent in this full range of gloriousness [laughs]. I’m thinking about that with the new ones — how does a surface read, and what does that mean to have that sort of figurative internal space be enveloped in this profound level of extraordinariness, transcending into a different way of thinking, operating, and activating? H: Would you say your work explores queerness in the public sphere? NC: Yeah, and also just how I chose to sort of be in the world. Like how do I chose to see in the world, in my surroundings, and where I’m at in that moment. 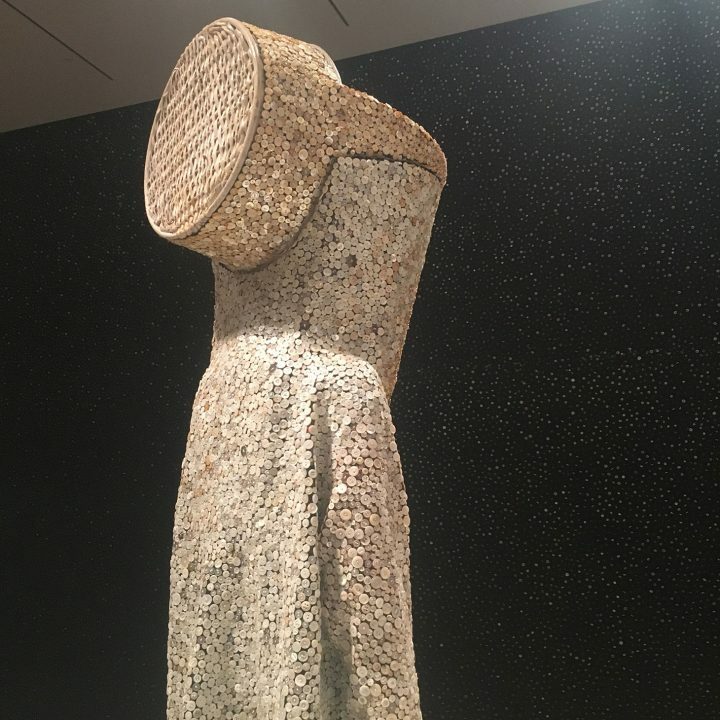 I could be in Dakar [referencing his Art in the Embassies commission project in Dakar] tomorrow, and what does that mean if I let my guard down and chose to see? I’m experiencing a whole different kind of impulse and desire. H: So the context is as important as its everyday function? NC: Yeah. When I was in undergrad … I would go to the museum of Natural History, and I’m looking at these artifacts that are part of a particular culture and yet, you know, I’m forced to look at them as these sort of art objects. And so I’m thinking, well, okay, they’re taken out of context, and they’re put in this setting, so I have to come to it in a different way, but I can still imagine what that would be like on the body. The function of the object: I’m interested in the duality of that. I think that even with the Soundsuits I can sit here and imagine what this would feel like and be like on the body, through the lens of this sort of encounter, this sort of up close and personal … aspect of it. This is a hybrid of something other, and that is what I’m … interested in. You don’t need to know what it is, the other. It’s just how do you open yourself up to accept that it is not something familiar? H: What would you say your connection to nature is like? H: That reverence built into the everyday. H: You talk about dreams and the need to have more dreams in our lives. How does your work contributes to people’s dreams? NC: I think the dreaming, or that imaginary space, comes through the process of building and constructing, because I don’t sketch anything. And it would be hard. Whatever I pull out is what we’re gonna make, and build with. 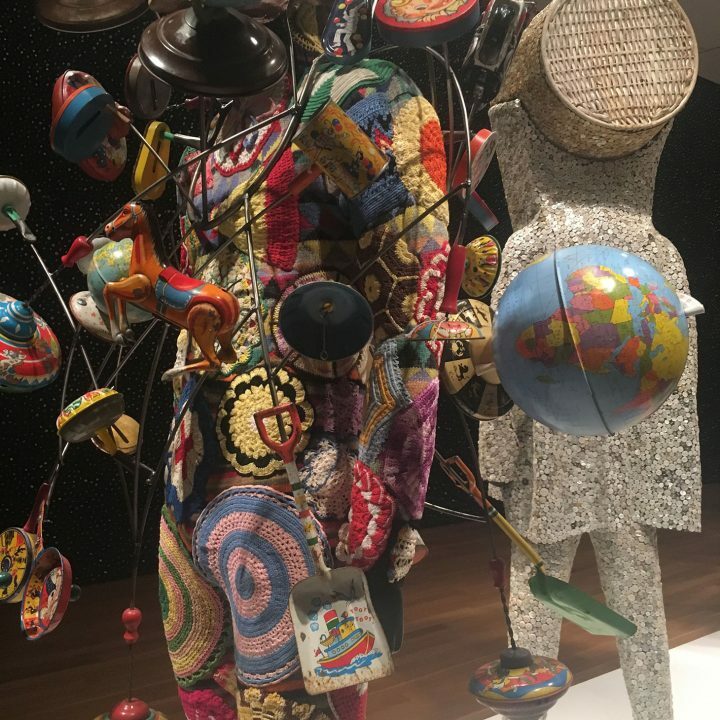 And that acceptance of material, and how we find ways of connecting and building based on circumstance, and how we exist in the world. You know, we could be having a lovely day, but then in a second there could be a mass shooting. How does that shift our existence, our internal beliefs, and yet, yeah, I gotta pick up my daughter from dance. 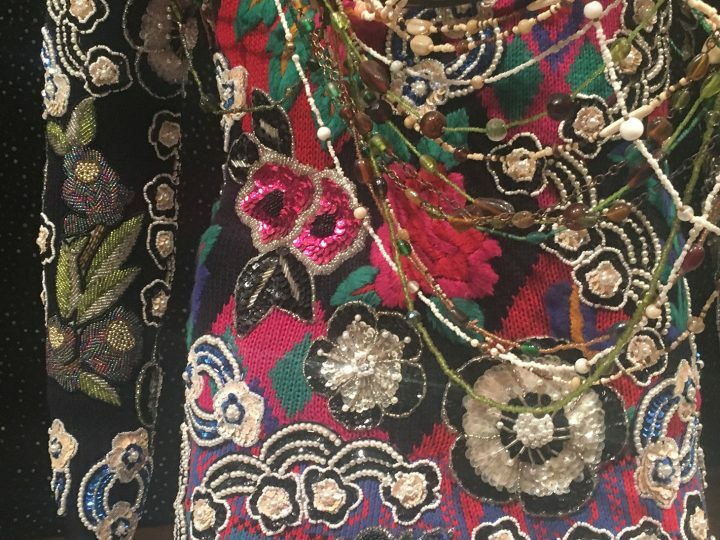 I mean, it’s all these things layering and interfacing all at the same time, and yet I’ve got to somehow still remain grounded in the midst of complexity. And I think that’s how I chose to build the work. There is order, but then there is also in some cases no … rhyme or reason why this is juxtaposed to that, but somehow I’ve sort of found ways that it makes sense. [laughs] How do we make sense of it all? Editor’s Note: The interview was edited for space limitation, clarity, and flow with as much accuracy as possible. Feat. 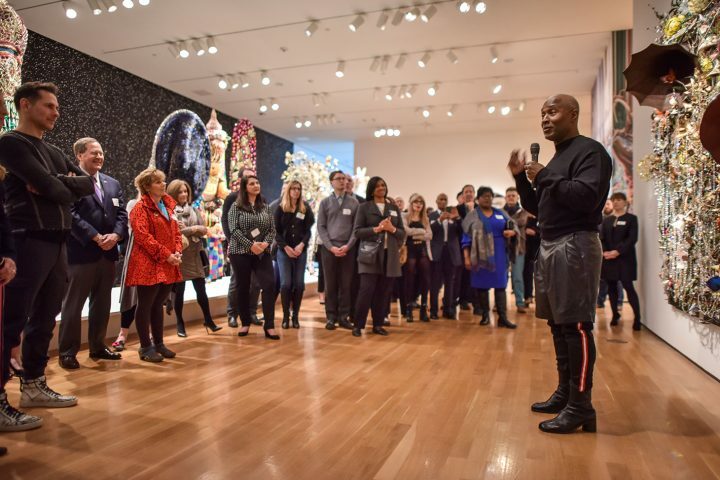 runs through June 2, 2019 at the Akron Art Museum in Akron, OH. 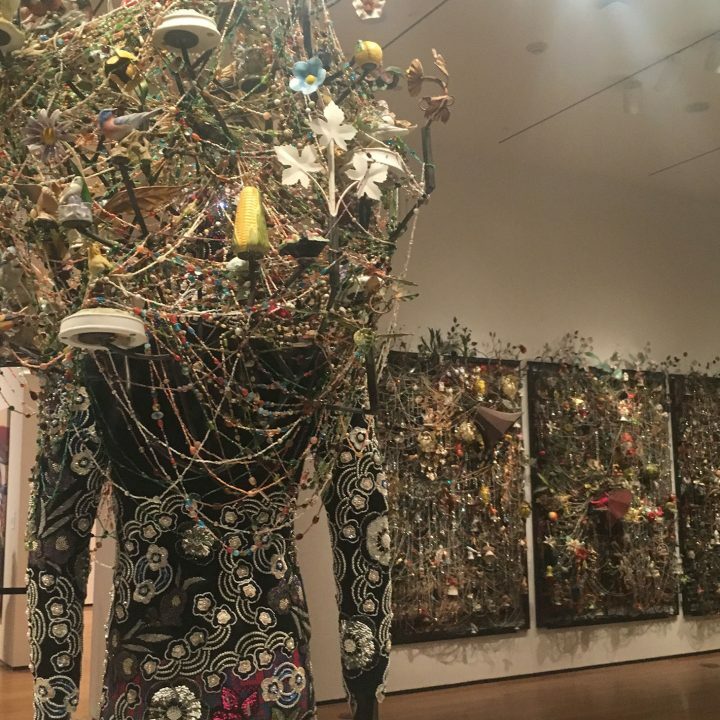 Nick Cave will be performing “HEARD-AKRON” in two multifaceted free art performances incorporating the soundsuits, local professional dancers, and musicians at the Summit Lake Community Center on Saturday, April 27 at 12 pm, and then at Akron Art Museum on Sunday, April 28 at 2 pm.